Here, I offer you another tidbit to tempt your palate for other-worldly tales: a story of a mysterious European and of Akbar, the 16th century Mughal emperor. The European goes by many names: Ucello (after the painter), Vespucci (after the explorer), and Mogor dell’Amore (meaning “Mughal born out of wedlock”), and seems to have magical powers. Several times he comes close to death, but always escapes, often with newly acquired (usually stolen) wealth. Has he learned these skills from an enchantress who might be his mother and might also be Akbar’s great aunt? 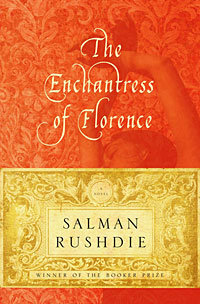 Into this novel Rushdie mixes historical characters from Asian and European history: Akbar and his Mughal court; Machiavelli and Renaissance Florence. Even Vlad the Impaler makes an appearance. Rushdie reportedly spent several years researching this tale — evidenced by a 4-page bibliography of source materials. The Akbar he gives us is violent, sweet, moody, and quick to anger, but also thoughtful, questioning his purpose in the life of his empire. From his imagination he has created a perfect wife, who has become a presence everyone can see, and who haunts his palace at Sikri even when he’s off beheading up-start princes. His young sons are treacherous wastrels, and he fears their growing power: he expects they will kill him when his own power weakens. Yet he loves them. Is this what we all do? the emperor asked himself. This habit of the charming lie, this constant embellishment of reality, this pomade applied to the truth. Is the roguishness of this man of three names no more than our own folly writ large? Is the truth too poor a thing for us? Is any man innocent of embellishing it at times, or even of abandoning it entirely? The poverty of truth is just one theme of this novel, where Akbar’s and Mogor’s stories slowly unfold and we gradually learn why Mogor has traveled from Florence to northern India to present himself to a powerful emperor, and why Akbar’s love for Mogor waxes and wanes. It’s a treat to follow Rushdie’s twisty plot, which so perfectly matches the lives of these two protagonists. This entry was posted in Adventure, Historical fiction, Magical realism and tagged Salman Rushdie. Bookmark the permalink. Ah, I now see the connection to Henry James’ narrative lies that you noted elsewhere. Perhaps the fiction that both hides and reveals the truth? Thanks for making that connection — unintended, but probably there all the same. The sum realization of all my literary and linguistic studies is the following: Every speech act (whether oral or written) is a mixture of truth and lies — the auditor/reader’s job is to sift through it all to discover the underlying meaning/s. In short, it’s a wonder we can communicate at all. But at least we keep trying!